How cool is this? Air Juan taking off from Manila Bay. Image source: Heinz Rentmeister. Beginning April 1, Cebu Pacific (CEB) will add a daily flight from Manila to Tagbilaran for a total of 28 weekly flights. CEB will be operating 51 weekly flights between Cebu and Davao, a gateway to the country’s southern islands, starting May 1. Throughout the summer season, the airline will also increase weekly frequencies from Cebu to the following domestic destinations: Bacolod (up to 17 flights), General Santos City (up to 10), Kalibo (up to 17), Puerto Princesa (up to 22) and Zamboanga (up to 12). “Those flying between Cebu and Iloilo can choose among 16 weekly flights, with some flights upgraded from ATR to Airbus A320 aircraft to increase the number of available seats. Within the first week of April, CEB also aims to meet robust passenger traffic in Visayas and Mindanao,” the company said. Starting May 1, the carrier will add three weekly frequencies between Iloilo and Davao, two weekly frequencies between Davao and Zamboanga, and four weekly frequencies between Zamboanga and Tawi-Tawi. Cebu Pacific is also beefing up its flights from Iloilo and Davao to Singapore. Starting today, the airline will add one flight per week from Iloilo to Singapore, and another flight per week from Davao to Singapore starting April 2. This means the airline’s Iloilo and Davao hubs will be operating three weekly flights each to Singapore. Last March 28, Philippine Airlines (PAL) landed for the first time in Doha, Qatar. The five times weekly service (Monday, Tuesday, Thursday, Friday, Saturday) to Qatar’s capital city will use the Airbus 330-300 which offers economy and premium economy classes. The whole cabin comes with free Wi-Fi for 30 minutes and 15 mb of video streaming using the passengers’ personal devices through the app myPAL player which can be downloaded through iTunes or Google store. Tickets for the Manila-Doha route starts at $665 (one way), and US $760 (roundtrip). The Doha-Manila tickets, meanwhile, starts at QAR 980 (one way) and QAR 1,400 (round trip). V Air launched its inaugural Manila-Taipei flight last Sunday with evening flights every Tuesday, Thursday, Saturday and Sunday. It uses A320 and A321 aircraft that can seat 180 and 194 passengers, respectively, in an all-economy configuration. The Taiwanese carrier is also planning to have direct flights from Taiwan to Kalibo, Puerto Princesa and Cebu. “There are more younger travelers coming to the Philippines. Our roundtrip fares are about P3,000 and I think the competitors’ prices are double,” V Air Chief Commercial Officer Bernard Hsu said in an interview at the Ninoy Aquino International Airport after the inaugural flight. It will go up against local budget carrier Cebu Pacific and flag carrier Philippine Airlines, as well as China Airlines and EVA Air. “Most of them are full-service airlines, except Cebu Pacific, but Cebu Pacific departs early morning, not at night,” he added. 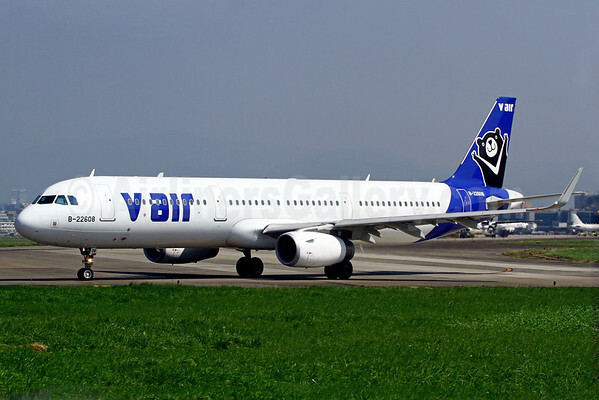 V Air has already secured government approval to offer daily flights, which it hopes to launch by the second half of the year depending on the initial market reception. “Young travelers also want to go to the beach and tourism destinations because Manila is more on business and shopping. We want to provide them a combination of both, so they may enter through Manila and spend a few days in Kalibo then fly back to Taiwan,” he explained. GMR Megawide Cebu Airport Corp. (GMCAC) announces the launch of two more international destinations out of Mactan-Cebu International Airport (MCIA). Xiamen Airlines of China is launching a route between Cebu and Xiamen of Fujian province in China on March 28, 2016. The flight departs Xiamen at 9am on Mondays, Wednesdays and Saturdays, arrives in Cebu at 11:55 am, and return to Xiamen one hour later. This is three times a week. It will the 170-seat capacity Boeing 737. Xiamen Air has previously opened international routes to Southeast Asian countries including Malaysia, Singapore, Indonesia, Thailand, Cambodia and the Philippines. Taiwan-based EVA Airways will inaugurate this March 27 the daily Cebu-Taipei-Cebu flight. It departs Taipei at 7:10 am and arrives in Cebu at 10:05 am. It leaves Cebu on the same day at 11:05am and arrives in Taipei at 2:00pm using an Airbus 321. This is EVA Air’s second Philippine destination after flying Manila daily. “It’s a very exciting time for MCIA- we’re growing our capabilities as a gateway to one of the country’s most competitive regions,” said GMCAC President Louie Ferrer. Before the month ends, GMCAC will be launching a Cebu-Dubai flight through Emirates. Philippine Airlines (PAL), the country’s flag carrier and the first airline in Asia, celebrated its 75th year on Tuesday and as a treat, the airline is offering a 75-percent-off seat sale on both domestic and international flights until Sunday (March 19). PAL launched on Tuesday its first direct flight from Cebu to Los Angeles. The CEB-LAX flights are on Tuesdays, Thursdays, and Saturdays, departing at 6:25 p.m. and arriving at 6 p.m. on the same day because of the international date line. Return flights are scheduled on the same day, leaving at 8:40 p.m. and arriving in Cebu at 4:40 p.m., two days later due to the time difference. Cebu Pacific’s inaugural Manila-Guam flight arrived Tuesday, giving travelers three airlines to choose from on the route. And with increased competition, Gov. Eddie Calvo said, Guam residents could see more affordable cost of travel, not just for vacations, but also for Guamanians to receive health-care services offered in the Philippines. Philippines-based Cebu Pacific is scheduled to fly four flights a week between Guam and Manila. 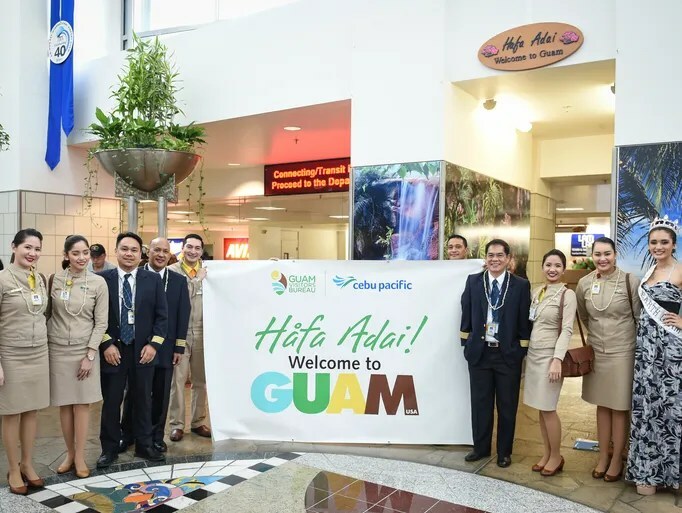 Guam is the budget airline’s 30th international destination, and its first U.S. destination, said Candice Iyog, vice president of marketing and distribution for Cebu Pacific. Tuesday’s welcome ceremonies for Cebu Pacific’s entry into the Guam market led some officials to reflect on Guam and the Philippines’ shared past. Spain ruled the Philippines and Guam until the signing of the Treaty of Paris in 1898. In that treaty, which the U.S. Senate ratified by a margin of one vote, Spain sold Guam and the Philippines to the United States for $20 million, according to the U.S. State Department’s Office of the Historian. “It feels like home; it feels familiar,” Iyog said of some of her first impressions of Guam. “We have a shared culture and history … we have similarities in culture,” she said at a ceremony welcoming Cebu Pacific at the A.B. Won Pat International Airport Guam terminal. Philippine Consul General Marciano R. de Borja remarked that before airlines, Spanish galleons plied trade routes across the Pacific, including Guam and the Philippines. Low cost carrier JetStar Japan, a member of the Australian-owned JetStar group of companies, announced that it will be flying between Manila to three destinations in Japan—Tokyo, Osaka and Nagoya—starting March. JetStar Japan’s chairman Masaru Kataoka told reporters on the sidelines of the flights’ launch at the SMX Convention Center that traveler flow between Japan and the Philippines has been growing quite quickly, prompting the airline to launch Manila-Japan flights. “There is a big potential in the tourist flow between Philippines and Japan,” Kataoka said. According to Kataoka, Japan last year welcomed 230,000 Filipino visitors while the Philippines received 400,000 Japanese tourists. He said these numbers are expected to grow by more than 50 percent this year. With Japan having eased visa restrictions to Filipinos, Kataoka said the airline is anticipating even more Filipinos would visit Japan. Despite the Philippines’ burgeoning budget airline industry, Kataoka said it is still an opportune time to join the market. “We offer the lowest fare in the market,” he said. “Our services will also support the increasing number of Japanese tourists visiting the Philippines as it is a popular year-round destination with its wide selection of shopping, beaches, leisure activities, as well as its vibrant arts and entertainment scene,” he added, noting that the Japanese are always very impressed by the Filipinos’ warm hospitality. Besides, competition makes any business flourish, he pointed out. He said JetStar Japan is confident it can play the field well because their offered fare rates constantly change with the movement of their competitors’ prices. “They [the customers] can choose where they buy the ticket. We offer the choice,” Kataoka said. From mid-March, the new routes from Narita Airport in Tokyo and Chubu Airport in Nagoya to Manila will offer customers the choice of up to seven direct services a week from 15 March and 1 April respectively. From 7 April, Jetstar Japan will introduce up to four new weekly services from Osaka – complementing the existing four weekly services schedule currently provided by sister airline, Jetstar Asia. “Since 2004, Jetstar has built our reputation for providing low fares and making travel more affordable. We hold true to that commitment and this is what we are bringing with us with this latest international offering,” Kataoka said. Kataoka said that eventually, JetStar Japan will look into launching flights to and from other destinations in the Philippines but, for this year, the airline will concentrate on growing the Manila to Japan flights. Jetstar Japan is the largest low-cost carrier in Japan. The airline started flying in July 2012 to Tokyo, Osaka, Sapporo, Fukuoka and Okinawa. Other domestic destinations currently include Nagoya, Oita, Kagoshima, Matsuyama, Takamatsu, and Kumamoto. In 2015, Jetstar Japan added Hong Kong as its first international destination, followed by Taipei. To date, Jetstar Japan has served 12 million customers in just three years of operations. It currently has a fleet of 20 new Airbus A320s configured for 180 passengers. Jetstar Japan is a joint venture between the Qantas Group, Japan Airlines, Mitsubishi Corporation and Century Tokyo Leasing Corporation. Jetstar Japan operates more than 100 flights a day to 17 domestic routes and 5 international routes. Seven international airlines have expressed interest in mounting flights to Clark International Airport. CIAC president Emigdio Tanjuatco III identified the seven airlines as Jet Star of Singapore, Thai Smile of Thailand, Rayani Air of Malaysia, Express Air of Indonesia, Air India, V-Air of Taiwan and Airline 4.0. Currently Clark International Airport hosts Qatar Airways, Asiana Airlines, Dragonair, Jin Air, CebGo, Tiger Air of Singapore, Air Asia Berhad and Cebu Pacific Air. These airlines connect Clark to Hong Kong, Singapore, Bangkok, Macau, Pudong, Incheon, Doha, Dubai, Davao, Cebu and Kalibo. Emirates Airlines announced that it would launch a daily service from Dubai to Cebu and Clark starting March 30, using a Boeing 777-300ER aircraft. Tanjuatco earlier said he was in talks with other carriers to expand operations in Clark as the airport can accommodate five million passengers annually. CIAC plans to construct a P7.2-billion low-cost passenger terminal building, designed by Aeroport De Paris of France. The first phase would increase the terminal’s capacity to eight million from the current five million passengers a year, while the second phase would increase the capacity to 46 million by 2025. The government was also looking into the feasibility of bidding out the Clark Airport operations and maintenance and the construction of the legacy terminal and improvement of the facilities required on the airside and landslide. Aside from Clark, the government plans to auction off the P74.56 billion NAIA Development Project, which aims to turn over the operation and maintenance of the country’s main gateway to the private sector under a public-private partnership scheme. It also aims to tap the private sector to redevelop the airport’s facilities. The plan is now being studied by the board of the National Economic and Development Authority. A recent study done by the Japan International Cooperation Agency showed NAIA would exceed its designed capacity this year, with its four terminals handling 37.78 million passengers, above the 30-million capacity. By 2040, passenger traffic would reach 101.49 million, according to the Jica study. Happy 20th Birthday Cebu Pacific!